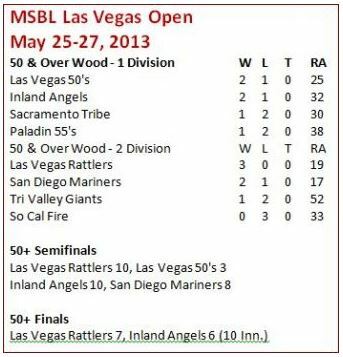 LAS VEGAS, May 27, 2013 — Enrique Borboa’s bases-loaded single in the bottom of the 10th inning broke a 6-6 tie and gave the Las Vegas Rattlers a 7-6 victory over the Inland Angels in the Las Vegas Open 50-over championship game at Hadland Park. Borboa’s game-winning hit scored Tony Hulbert and followed Scott Hunt’s bases-loaded walk which tied the game. The Angels, an Orange County, Calif., team that went 3-2 at the LV Open, fell behind the Rattlers 5-0 after five innings. But the Angels tallied one run in the sixth and four runs in the eighth to tie the score at 5-5.Sam Pacheco, who pitched the final two innings for the Rattlers, was the winning pitcher while Rob Calvert, who hurled the last five innings for the Angels, took the loss. “We didn’t give up,” said Las Vegas Rattlers manager Manny Ocampo. “Mentally and physically, they just believed in themselves. We went this far, so we just could not give up. “I was impressed with the fact that we only played with 10 players most of the games. We had an 11thbut he was injured on the bench. I was impressed with the fact that we played with 10, no more than 11, when we were supposed to have at least 14 on the roster. The Angels also were impressive by scoring six runs over the final five innings of the championship game. “It was a well-fought game,” said Angels manager Ted Poleto. “Both teams played hard. We just played really hard (and) fought back from 5-0, tied it, went ahead by one, and they (the Rattlers) just came back and battled back and pulled the game out.